So, now that I have clarified what is meant by teeing ground, what should we call the whole area prepared by course maintenance staff for the siting of numerous, optional teeing grounds at the start of each hole? Well, I use the term ‘tee box’, but I am aware that others may call them teeing areas, tee decks or just tees. The term 'tee box' originates from the days before wooden or plastic golf tees became commonly used, when the practice was to place a box of sand alongside the tee markers, so that golfers could make a small mound to place their ball on before making their first stroke on that hole. 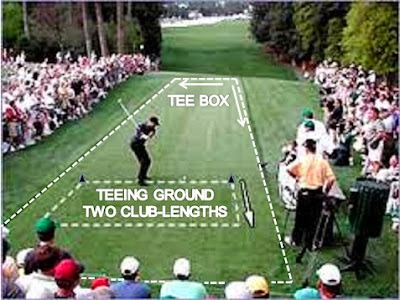 The larger the total area of the tee box the more likely it is that a reasonably maintained teeing ground can be used for successive competitions, as a teeing ground that is repeatedly used will obviously be subject to more wear and tear damage, particularly on par-3s where many players do not tee-up their ball and can take significant divots. Tee boxes - A ball lying on a tee box other than the one being played must be lifted and dropped at the nearest point of relief not nearer the hole. Although this type of Local Rule is not uncommon, I am totally against its introduction and I encourage all golfers to recommend that it does not operate at their Club or Society course. My main concern is that golfers who find their balls at rest on a tee box other than the hole that they are playing may not take the permitted relief correctly. This is especially true when dropping a ball within one club-length of the nearest point of relief may mean dropping on a downslope, or in an area of rough, which is not unusual where teeing boxes are built on raised ground. I am a great believer in requiring players to play their ball as it lies wherever possible; the more often a player is permitted to lift their ball under the Rules the more likely they are to breach one. Also, Rule 33-8 permits Committees to establish Local Rules to deal with “local abnormal conditions”, which in my opinion does not include protecting tee boxes, which are common to all golf courses, except possibly on newly laid teeing surfaces, when a Local Rule may be appropriate on a temporary basis. In any case, it is my experience that the number of occasions that a player‘s ball comes to rest on a ‘wrong’ tee box is minimal and is unlikely to damage the playing surface to any material extent that would then negatively affect the area when it is next used as a teeing ground. Hi Barry ,A timely blog on injured golfers & their aides. My dad, injured by age if you will, had dupetryns contractures badly in both hands, which severely limited his ability to grasp the club at all. His remedy was to cut a chunk out of the grip, worked perfectly, but as we all know is highly irregular. After many arguements with fellow vetrans who wore glasses, orthotics, pace makers, had titanium hips & used extra flexible shafts, outsized grips & club heads, & 5 irons that looked like drivers, he eventually quit the sport he loved, because his affliction was not catered for. He lost many years of social interaction, exercize, & outofthehouse&yard time because of a ridiculous adherance to the rules of golf applied to old folk!. I think we need to make a greater accomodation to the frailities of age-ing if we are keen to keep as many veterans as possible in the game, on the course & in the club houses of golf clubs around the globe. We all grow old & im sure pro golfers are not allowed to ride around the golf course. Pro rules are not for the masses. Especially veterans! Im sure someone like you who has thought about the rules as much as you have could see some variation/modifications that could help to keep people driving longer. First, your comment obviously refers to the previous week's blog and not this one. I understand where you are coming from and wonder whether your father addressed his handicap with the competition Committee. I am pretty sure that in the circumstances most Committees would agree that the use of the modified grips would not give him any undue advantage over other players, a ruling that they are expressly permitted to make under the Exception to Rule 14-3. Barry I have a question regarding teeing grounds. My club like many others will use winter mats on some or all holes depending on how bad the weather has recently been.The obvious reason is to protect very wet tees from having big chunks taken out of them. The RoG defines the teeing area as going back two club lengths but most mats are not that deep. Can a committee write a temporary local rule to prohibit players playing of the the grass tee behind the mat if they were to cite this rule? Yes, it is permissible (sensible!) for a Committee to make this restriction under 'Winter Rules' for temporary abnormal conditions. See my blog dated 7th December 2011 for similar subjects that Committees should consider. Yes, the walls around the tee boxes were artificial constructions and are therefore immovable obstructions from which relief is available under Rule 24-2. In my opinion, a Local Rule extending the depth of a teeing ground to more than two club-lengths would not be permitted under Rule 33-8. If a winter mat was larger than that the Committee should place tee markers within it.